Sitting underneath the mother of pearl cabinet in the Hall Alcove, is this two handled Red Luster vase by William De Morgan. Luster ware pottery has a metallic glaze that makes it look different colors based on what light you view it through. De Morgan rediscovered this technique around 1873—74, after many years of experimentation. 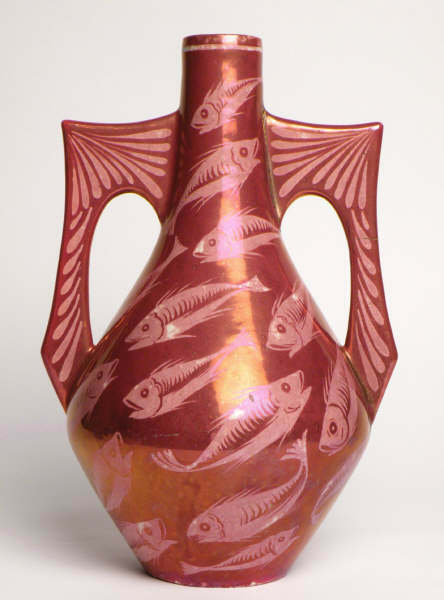 This vase is covered in fish, which was a common theme in De Morgan’s work. He took inspiration form the East, particularly that of Hispanic and Italian origin, as well as further afield. De Morgan did not only produce vases, he also produced tiles, other ceramics and stained glass windows. All of which were sold through Morris & Co.
De Morgan originally met William Morris when he attended the royal academy of arts. He had quickly become disillusioned by the ideas there and turned to Morris and the Pre-Raphaelite circle. He set up his first ceramic studio in 1872, in Chelsea but was not very successful at the start. His early work contained a lots of firing defects and irregularities. By the time he moved to Fulham, his work had become what you see today but he was beset by financial difficulties. Despite regular cash injections by his wife, Evelyn De Morgan an artist in her own right, De Morgan could not afford to keep the pottery going so it was sold. De Morgan eventually found success as a writer. Categories: Uncategorized | Tags: Arts & Crafts, ceramics, Chelsea, collection, conservation, De Morgan, Fulham, Historic house, House, Interpretation, National Trust, object, Objects in Focus, Pre-Raphaelites, Red Luster, Standen, William De Morgan, William Morris | Permalink. 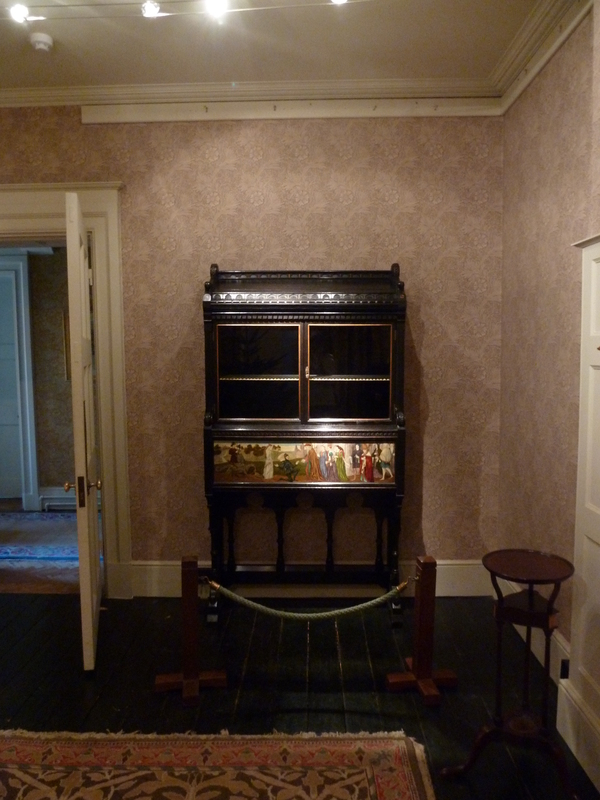 Recently we have been loaned a beautiful cabinet, designed by William De Morgan and made by J.P. Seddon around the 1870s, by the De Morgan Foundation. The cabinet is made of stained ebonised oak with floral inlaid motifs on its sides created from ebony, padoak, box and maple, as well as gilt accents. It also has an oil painting depicting St George presenting the princess and the captured dragon to the King. inspect it. I used three different brushes plus an ergo vacuum cleaner to do this. I used a hogs hair brush for the wood, mostly the back of the cabinet and a softer ponytail hair brush for the inlaid wood. I also used a separate ponytail hair brush for the gilt accents. Hogs hair is a lot coarser so can be damaging to soft materials but on hard woods it is very good at getting dust from little cracks and crevices. 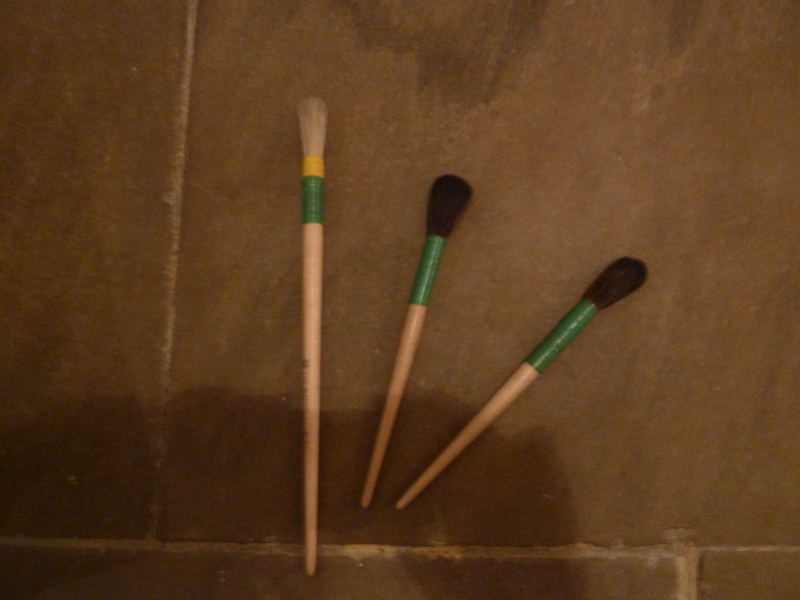 Pony hair is very soft and as such can be used on most materials apart from textiles. Dusting the cabinet also gave me the chance to inspect it for any possible damage like cracks or chips. 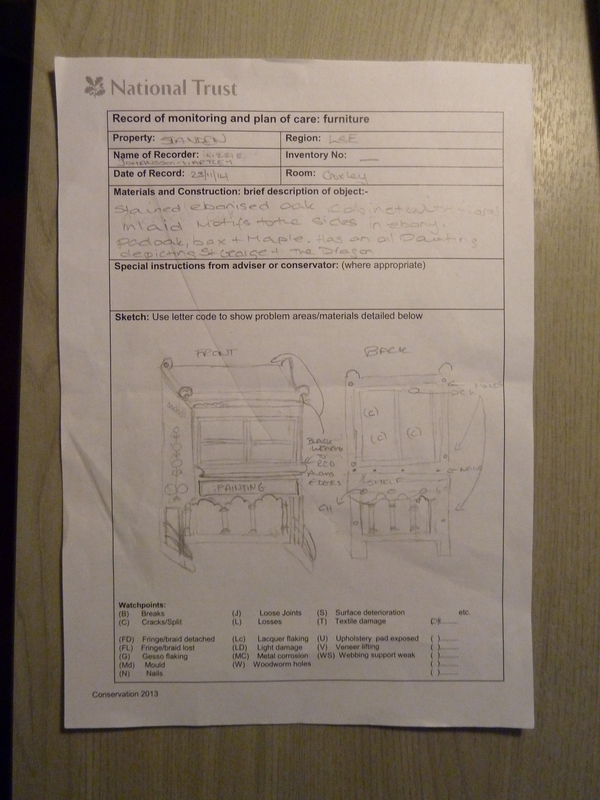 I recorded this all onto its Condition report, so that when we next deep clean it, someone can look at the report to see if there is any new damage. Categories: Uncategorized | Tags: Arts & Crafts, Cabinet, Christmas, cleaning, collection, conservation, De Morgan, De Morgan Foundation, deep clean, Furniture, Historic house, House Team, National Trust, St George and the Dragon, Standen, William De Morgan | Permalink. 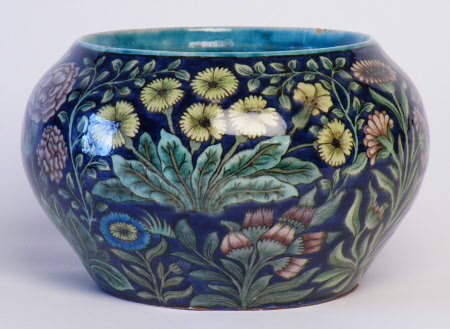 The bowl is a beautiful piece by the potter and designer William Frend De Morgan (1839-1917). 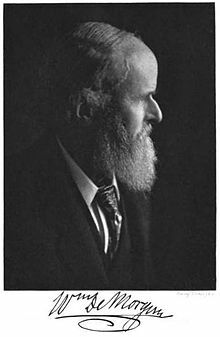 De Morgan was one of the leading designers of the Arts & Crafts movement, and was also a close friend and collaborator of William Morris. De Morgan designed many pieces for Morris’ company, Morris & Co., channeling his talents into not only ceramics, but also stained glass and furniture design. 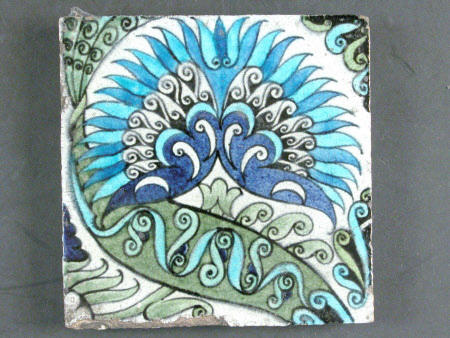 A Middle Eastern-inspired tile by De Morgan. Like his fellow Arts & Crafts advocates, De Morgan was inspired by Medieval imagery, but he was also influenced by Middle Eastern designs – particularly those from Persia. The inspiration for the motifs and colours of this bowl is probably drawn from Persian designs – the use of yellows, pinks, blues and purples was especially common in Persian ceramics (often also referred to as Iznik ceramics). The overall design of the bowl is striking, and it appears almost contemporary – one of our volunteers remarked that it looked ‘almost modern’, and wouldn’t look out of place in a present-day home. The intricate decoration of De Morgan’s designs was carried out by a very skilled group of decorators. Many De Morgan pieces were signed by their decorators, which gives a fascinating glimpse into the manufacturing process. 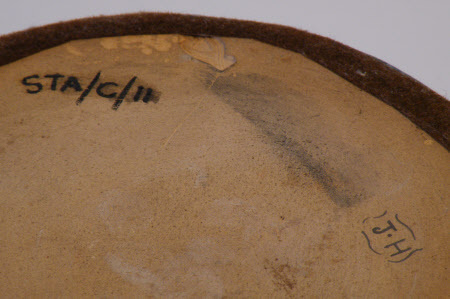 This particular bowl is signed ‘J.H’, which we know was a decorator by the name of J. Hershey. Standen has many De Morgan pieces throughout the house, and the variety in designs illustrate his talents. In the Drawing Room you can see not only Middle Eastern inspired pieces, but also many items of lustreware – ceramics finished with an iridescent metallic glaze, a technique which De Morgan is credited with reviving. Perhaps one of the reasons the bowl is such a favourite with our volunteers is its connections to the Beale family. It was given to Mr and Mrs Beale for their silver wedding anniversary in April 1895 by their children. It is the only piece of De Morgan the Beales owned, but was the inspiration for Arthur and Helen Grogan, the first National Trust custodians of Standen, to buy more of the De Morgan ceramics which you can see around the house today. Categories: Uncategorized | Tags: Arts & Crafts, Beale family, ceramics, De Morgan, Grogan, Iznik, lustreware, Middle Eastern, Morris & Co, object, Objects in Focus, Persian, Standen, volunteers, William De Morgan, William Morris | Permalink.